Rollin.io Dice Games Review – Scam or not? Today we will be looking into Rollin.io and the only game that they offer on their website. Taken from the name of rolling a dice, they have made a website wherein all dice lovers would flock to. They do not offer any slot, table or lottery games like any other online casino websites out there today as they only offer one game and one game alone; and that is DICE. 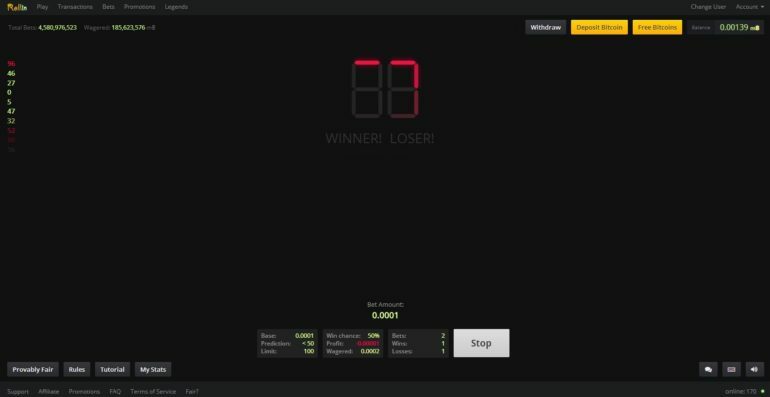 In Rollin.io, they only have one DICE game and you are not flooded with re-inventions of slot dice games or scratch games which usually fill online casinos today. Oh and by the way, did I mention that you can get free Bitcoins with them? You start the game by choosing your bet size. Since we were given free Bitcoins to play with, we are able to try out a few draws and have fun with the free coins that we have. You are able to choose your bets on the lower section of the game window. Here you are able to see the “Bet Size” tab wherein you are able to control your bets by 1/2, x2, Minimum and Maximum bets with just a few clicks of your mouse. Beside the Bet Size, you are able to enter the prediction number you want to predict. I think the default number is set to 50. Your main goal is to guess which draws are going to be made. If your prediction number is at 50, you need to win either of the options that you choose from. So if you chose “Roll High” this means that all numbers that are drawn above 50 means that you win the game. If the draw is below 50, then you lose your wager. In manual games, you are able to click on “HIGH” or “LOW” on your own queue. This means that you can take your time on how long you would be clicking on either of the buttons. You are also able to automate the game if you are into numbers or you think you have an equation for the automated dice feature. In the automated feature, you are able to access this by clicking on the “ROBOT” button on the game screen (This button has a space rocket picture). By clicking on it an additional window will pop-up and you will be able to adjust everything here. 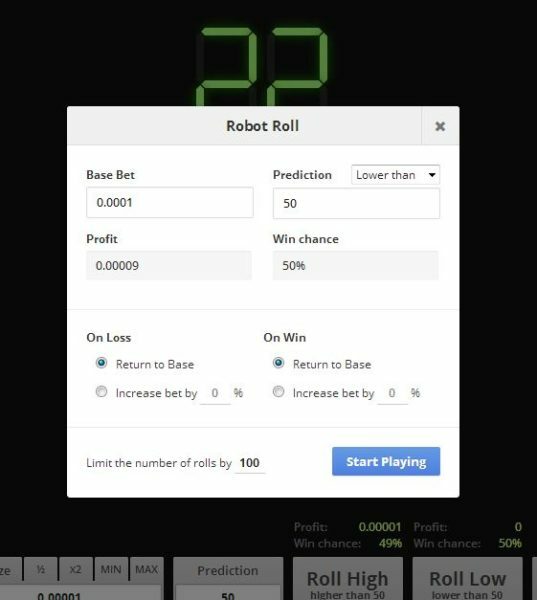 You start with the “Base Bet” which is the bet you want to place for your automated bet system. This is just the same as manual betting, the only difference is that this will be done every second and you do not need to click anymore. You will, of course, have the “Prediction” number wherein you need to input as well. Everything found on this tab are pretty straight forward and it wouldn’t be hard for you to figure it all out with just a few tries. Please be advised that you are able to stop the automated draws easily by clicking STOP. Websites like Rollin.io that has only one Dice Game is really amazing as people would not be confused on all the clutter that is happening on their websites. A lot, if not all online casino websites out there today are filled with useless “Dice” games that clearly aren’t Dice games at all. If you have the time, I suggest trying this website out. It’s fun! And you can play for free. Not to mention, they also have promotions to look forward to every week!